I decided to share the 29 lessons in two blog posts, because 29 is a big number of lessons to squeeze into one sitting. Your eyes might get tired! So anyway, here goes! Small acts of love make huge imprints, and yet they are the easiest moments to forget. Keep tabs on what matters. Not the stuff that frustrates, but all the times, countless times, love has been offered. I don’t need to talk him out of his frustration or talk him up to a good mood. I just need to give him space to mentally work through the hard things. I need to stop talking. 3. STOP & think about our life. It’s easy to forget everything. It all gets so routine that the good things get mushed into bland, ordinary moments. Take a minute, think back, gratitude restored, thanking God fully. 4. Loves needs a place. We eat at our kitchen table 5 nights a week. Because we need to slow down together, nurture love by conversing, forgoing distractions, and focusing on our relationship. 5. I am a woman, continually changing… and likewise, he is a man continually changing. Suddenly 4 months into marriage, I realized I’m a different woman. Four more months pass, and somehow I’m even more different. And he is too. We’ve always been changing even when we were single, but now we see it better because we are living & growing with another person. So yes, you’re different after marriage & the relationship dynamic changes. And that’s good. Even needed & quite healthy! 6. Love is in the past, looks towards the future, but it actually LIVES in the present. I totally understand that the above phrase sounds c-h-e-e-s-y! I’ll own that. But hey, if I keep looking backward or forward, I will miss everything happening around me. And honestly, I’ve probably missed full months of life just by looking everywhere except the 24 hrs I’m currently living. 7. Keeping Christ as the center focus in our relationship is a daily choice and still really difficult. When you’re dating, it’s taught “Oh, keep Christ the center, keep Him the center. You don’t want to get into any trouble before you get married! !” As if getting married with all the right choices in tow will secure your foundation in Christ without any further effort on your part. But when you get married, if you don’t daily choose Christ to be your foundation, things fall apart in small ways that become a big deal. We have to continually choose again & again to live for Christ individually and as a couple. 8. Love is NOT blind (at least most of the time!). Real, nurturing love defines the heart problem when I can’t. I’ll never forget the evening I sat across from Ben and he, in a few words, depicted exactly what I couldn’t see. I knew something was wrong in my heart, but I was blind to my own selfishness. Immediately, I started crying. He thought he was being harsh. He wasn’t. I was relieved & ashamed to hear exactly the issue that I couldn’t previously point out. But boy, the road to healing & recovery was sweet & came because love sees when I can’t! It doesn’t ignore, but it often stays silent so the other person can grow individually without the constant chatter of this, that, and the other way that change could come about faster. Love says, “I’m going to let you grow in your own time, and I’m here if you need my help.” I’m a slow grower, and Ben is kind & patient while I plod my way along. A great gift! 10. Love doesn’t need an Instagram account or a Facebook update. Knowing is different than applying. I think we ALL know this. Do I post about my life with Ben on social media? You betcha! But these days, I check myself before I post on either account. Why am I posting this? For my benefit? To gain attention? To show off? There have been many times, I’ve not shared anything because my motives for doing so would be wrong. Marriage has taught me how beautiful privacy is! 11. The strength of generosity. Oh, it is so beautiful and hard and worth it. There is nothing that makes a person feel more loved than simply doing something without all the tangled strings attached. “I’m going to do this for you, just because. Period.” Nothing back, nothing expected–just because. I’ve found that the best gifts given in a marriage are just that—gifts. 12. Misunderstandings help me better understand my spouse! Wait…what?! This statement is only true if I purpose to talk through all the misunderstandings that seem to happen daily. By talking through it, we’ve learned how each other thinks, what tones we should & shouldn’t use, what phrases we should stay away from, and how each of us is going to respond. We talk through our misunderstandings all.the.time. It’s amazing how differently we each think on something, how much something hurt that didn’t need to, and how easy it is to resolve it all by just being open. There will always be misunderstandings, but it doesn’t always have to hurt. 13. (from my husband)— You should always have something in your mind at any second. 14. Everybody tells you that pet peeves will be 10x worse when you get married, but you know?! All those good traits are 10x better too! It’s less shiny & a whole lot more beautiful. It’s truly wonderful when someone loves you anyway, when they take care of you despite it all, when their patient and gentle. It’s fun when those small things like a laugh or a smile become more prominent. It’s a blast to live with funny jokes and smart facts– and all of this is magnified in marriage. So, it’s not just the pet peeves that get bigger, it’s the good stuff too. 15. I grew to value the hobbies of my spouse. As a human, we naturally value our own hobbies and pastimes. We enjoy them and look forward to doing them. We consider them a good use of time and wonder why not everyone else agrees with us! But, while Ben and I have similar pastimes, we do differ on a few. And I have learned to value his creative outlets & hobbies. I’ve learned to let him be, to stop & look every time he asks me to see his progress. I’ve learned to let go of his time, so he can do those creative things that help him relax, learn, and enjoy. And he’s done the same for me. In short, I’ve learned to let go of my own world, so I can step into his. 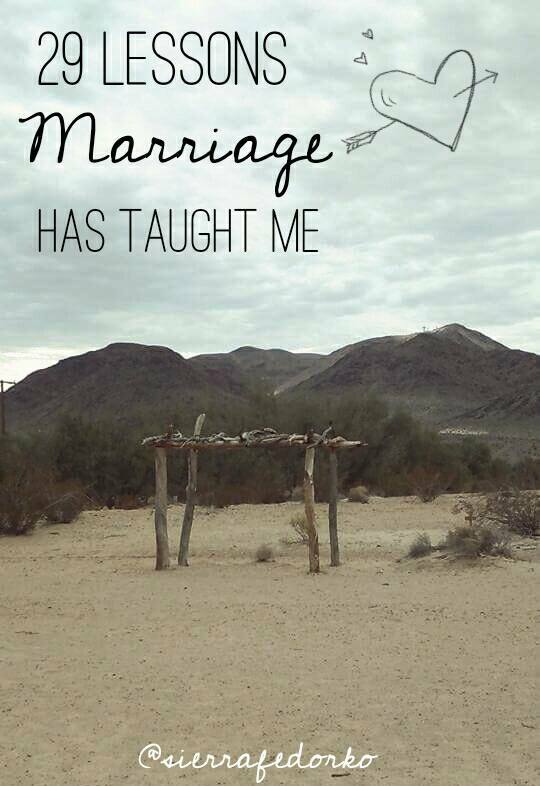 Read Part 2 of the Marriage Lessons–> HERE! Why Is She STILL Posting about Her Wedding? As a single man I found this post very insightful. I really enjoyed Lesson 5 and 12…. No problem….It was a great post!